Last week Belarus Digest published an article about the problems of technical assistance to Belarus. The current piece recommends possible solutions to those problems. In the first place the EU should send a clear message to the Belarusian authorities that Belarus will be able to receive more assistance if the regime decentralises and simplifies its system. This will encourage other actors to participate more actively in European programmes. The European Union should elaborate a “road map” for the future and outline priorities of cooperation together with the Belarusian authorities. EU representatives in Belarus should also try to work with Belarusian authorities at the local level as much as possible. The EU should also increase its cooperation with the Belarusian independent community of experts. As the level of Belarus' public administration remains quite low, the EU input can provide the most important ideas for the modernisation of the country. Lukashenka’s regime erects barriers to EU technical assistance. The authorities have created complex and lengthy procedures to obtain assistance, which worsens the conditions for the implementation of projects. Nevertheless, the projects in Belarus serve their function. Technical aid assistance opens up Belarus to the international community and improves the quality of state governance and the lives of people. Working with Belarus is difficult. Belarusian expert on European integration Aliaksandr Papko says that the “absence of freedom of local authorities to make their own decisions is still a great problem. 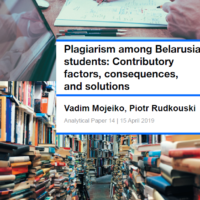 As a result, the local officials sometimes have to either wait for years till the top officials approve a project or refuse to take on any responsibility.” Thus, it is primarily the Belarusian side which can improve the efficiency using the aid available to them. Bearing in mind these differences, the EU message to the Belarusian authorities should be simple: even in today's political environment, Belarus could receive more. But the procedure for obtaining technical assistance to implement projects should be de-bureaucratised, so that project realisation is not delayed for a few years. Currently it takes two or three years from the identification of a project to the actual signing of a contract. The EU should increasingly engage local authorities and average Belarusians in European projects aimed at supporting Belarus' infrastructure. If the Belarusian authorities wish to work more closely with the EU, they would have make internal changes and decentralise the process of obtaining technical support. The European Union has provided over € 510m to Belarus for the years of the country's independence. This seems enough to demand certain concessions in the organisational sphere from the regime. It is important to understand that the authorities can easily simplify procedures for receiving technical assistance. They may be lazy and sly, but the bureaucracy can work if someone can clearly explain a direct relationship between the much-needed money and a simplification of procedures. Belarusians themselves need to stop thinking too much about the regime and try cooperating with the EU directly. According to the Delegation of the European Union to Belarus, even under the current political conditions, it is possible to do more. For example, Belarusian organisations could participate much more actively in thematic global calls for proposals and even more actively in regional and cross-border programmes. However, not many Belarusian organisations meet the EU’s requirements. Belarusians think that European programmes remain too bureaucratised. The European Union for its part should simplify the procedures surrounding the projects and applying to them. They should also promote initiatives that provide assistance to Belarusian civil society organisations on simple tasks, including how to develop project proposals for the European Commission. What Should the European Union Do? First, the EU and the Belarusian authorities should elaborate the “road map” of the technical aid for Belarus. In the document, the parties should outline common priorities, obligations and subsequent steps for rendering technical aid to Belarus in specific spheres. The EU will elaborate its own documents in the form of the country strategy paper, but the very creation of such documents should include the opinions of a larger number of stakeholders. Secondly, the European Union should be prepared to deal with the fact that the Belarusian authorities may not engage in dialogue. Therefore, such a document should be elaborated in the framework of a Dialogue for Modernisation. In this case, the status of this “road map” will be downgraded in a sense, but the EU and civil society will be able to coordinate their actions. Moreover, independent experts often understand Belarus’ needs much better than officials and can be more honest. Thirdly, the EU should cooperate with local authorities and NGOs as much as possible and facilitate their independence from the Belarusian regime. Local officials and NGOs may in turn prove to be the most open and willing to accept best practices in good governance. Technical assistance should become an instrument to improve the qualifications of Belarus' system of public administration. The more direct contacts between European officials and representatives of the Belarusian nomenclature have, the more likely the goals of the technical assistance provided and the common European strategy on Belarus will be achieved. Belarusian officials at low and middle level positions do not bear much of the burden of the regime’s viciousness and can become the main actors for future reforms. It remains important that the EU’s representatives should speak with the Belarusian officials, making them their partners, at the same time being an example of successful governing practises, democracy and transparency of the state governing. For this, they should organise more seminars for Belarusian officials, roundtable discussions and internships. The EU should keep Belarusian officials in its orbit. Belarus needs a long-term strategy by the EU. Still, it is difficult to demand long term change from European officials as they cooperate with Belarusian authorities whose actions have remained unpredictable. Thus, European policy makers should focus not just on the regime, but also on those who want to change it inside the country, and those inside the regime itself. It is also time for the EU to start promoting youth organisations which have clearly articulated social and economic agendas. From these organisations a new political class of Belarus will subsequently grow. There should be no illusions – most likely the quality of the cooperation will remain at the same level as now while Lukashenka remains in power. But increasing the efficiency of EU assistance may push Belarus towards European standards and broaden the pro-European mood and Europe's influence within the society and within the Belarusian bureaucracy. This April economic growth in Belarus was nearly at the level of last year's, which still remains significantly below the official forecast. The financial sector showed certain stability but the situation with attracting foreign capital and the nation's privatisation prospects remain uncertain. The growth of consumer and commercial deposits in Belarusian rubles provided the banking system with the necessary resources. At the same time a sufficient amount of liquidity in the banking system contributed to stability on the currency market. The gradual reduction of the refinancing rate was preserved. The National Bank carried out a second round of cuts and decreased the rate to 27%. It also allowed for reducing interest rates on 1-day loans in Belarusian rubles on the interbank market. The rates fell from 35% in January to 18.5% in March and continued to decline in April. 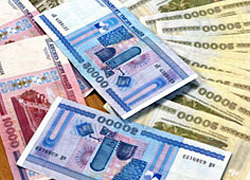 The supply of foreign currency on the Belarusian Currency and Stock Exchange increased due to a positive trade balance. The National Bank had to buy some foreign currency in order to prevent an excessive appreciation of the Belarusian ruble. This, in turn, had a positive effect on the dynamics of its international reserves, which grew by USD 136.2m and came to a total of USD 8,148.7m. The economy has kept growing at a gradual and steady pace. In the first quarter of 2013, the GDP grew by 103.5%, which is matches last year's growth. Belarusian authorities forecasted GDP growth in 2013 at the level of 8.5%. However, this prognosis raises doubts as the estimates of international experts remain more pessimistic when compared to the figures proposed by Minsk officials. According to the International Monetary Fund, the Belarusian economy will grow by just 2.1% in 2013. Predictions of Russia’s Ministry of Economic Development are more optimistic – 3.7%. The World Bank estimations predicts 4%. Net taxes on goods, retail and wholesale trade were the main contributors to GDP growth in the first quarter of 2013. Industrial production had a negative effect on GDP growth. Even though the volume of industrial production was reduced, inventories of finished goods formed almost 80% of total monthly production by the end of March, while this number was only 46.4% a year ago. The Belarusian government, however, plans to provide the required growth rate primarily due to its emphasis on achieving economic modernization. Attracting foreign investments remains a major concern for the government. The denationalisation of the Kommunarka and Spartak confectionery factories, which occurred back in October, has had negative consequences for the Belarusian economy. The main issue facing the leaders of the confectionery industry is finding proper channels to unload of their stocks. Denationalisation resulted in their losing many of their former distribution channels which remain under control of Marat Novikov, the former owner of the factories. At the same time the authorities have undertaken efforts to make the privatisation process more smooth and effective. At the end of March the Council of Ministers adopted a decree to introduce changes into the law on the privatisation of state assets. It intends on implementing specific measures in generating the private sector’s support such as the introduction of a ban on revising the terms associated with the results of the privatisation process. The reasons for making such a decision are rather straightforward. In 2013 Belarus has to sell at least USD 2.5 bn of its state assets in order to fulfil its obligations of its EvrAzES loan. However, events connected with the re-nationalisation of the leading producers in the confectionery industry, together with a gratuitous transfer of 21% of shares of the Luch watch factory to the state, undoubtedly raise serious concerns among investors with regards to the risks associated with property rights protection. These planned changes in the law on privatisation are suppose to signal an improvement of the situation and increase the attractiveness of making investments in the economy. Nonetheless, the forthcoming passage of the law “On Amendments to the Law on Privatisation of State Property and Transformation of State Enterprises into Joint Stock Companies” will bring innovations in management and the regulation of joint stock companies created through privatisation. This will have a negative impact and decrease the interest of potential investors in those assets, where at least some part still belongs to the state. At the same time, the introduction of a ban on the revision of privatisation deals does not protect owners from an abrupt transfer of control to the state, something that can be easily accomplished through the issuance of additional. While an the implementation of a ban is the right step towards creating conditions that will improve the investment climate in Belarus, it will not likely have a serious effect on stimulating the privatisation process in the near future. Overall, despite a rather robust and stable picture that characterises the situation in economy so far, Belarus continues to struggle to meet the targets set by the authorities.